ALISO VIEJO, CA--(Marketwired - Apr 5, 2016) - XsunX, Inc. (OTC PINK: XSNX), a leading solar and energy saving technologies provider, today announced that the Company has concluded the construction of another large state-of-the-art commercial solar power system. The latest, a 157 Kilowatt Solar Carport Installation in Anaheim, California, is capable of delivering over $1 million in projected energy savings in its first 25-years of operation. The project, which was installed in Anaheim to service a multi-tenant commercial office space, will significantly reduce the facility's operating costs by nearly $30,000 in the 1st year alone. Yearly savings will continue to increase to nearly $40,000 by the 10th year, while adding to the property's aesthetics and value. "We are very pleased with this latest installation. The robust solar carport application will provide our client with many years of clean energy and pay for itself in just over four years," stated Tom Djokovich, CEO of XsunX. He concluded: "Solar carports are one of the better investments commercial property owners can make. 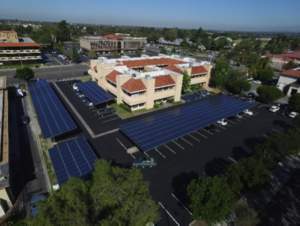 And, with our ability to offer solar carports at nearly the same costs as roof-top solar, we help turn parking areas into profitable assets allowing our clients to never look at their parking areas the same way again." XsunX's turn-key solar carport solutions, in addition to improving parking area aesthetics, enable clients to convert parking areas into valuable solar power plants capable of reducing facility operating costs and increasing net operating margins and property values while delivering thousands in valuable Federal tax credits. The company stands at the forefront of a growing sector in the renewable energy market that provides solutions unhindered by common logistical challenges associated with traditional roof-top applications. XsunX continues to develop its strategy to market to a broad range of customers including school, government, and commercial organizations where it believes it can favorably compete. About XsunX: XsunX specializes in the sale, design, and installation of solar photovoltaic power generation (PV), and energy saving technologies that provide our clients long term savings, predictability, and control of their energy costs. We install thousands of solar panels each year offering residential and commercial clients solar roof-top and carport system design and installation, battery back-up, LED lighting upgrades, and technologies to help with consumption tracking and control. We guide our performance by striving to keep the customer's best interests at the forefront at all times and delivering value through a focus on performance and follow-through that meets or exceeds customer expectations. The products and technologies we offer do not just meet industry standards, but lead the industry in innovation, reliability, and value.